A high quality blend of bamboo and microfiber comes together to create the ultimate in sleeping surfaces. Remarkably soft to the touch, extra durable, and totally affordable, this set would make an ideal addition to any bedroom. They're available in your choice of 12 luxurious colors, and they're made with deep pockets to fit any type of mattress, so you're sure to find the perfect set for any bed in your home. Eco-friendly bamboo fibers are combined with high strength microfiber yarn, and the end result is a lightweight and breathable material with excellent durability and comfort. The natural fiber blend provides a silky soft feel, and an upscale luster that's sure to impress. The bold colors won't fade over time, and you'll never have to deal with wrinkles either. Long lasting durability ensures years of regular washing, and each time you pull them from the dryer, they'll feel softer than when you put them in, and they will never come out wrinkled. Perfect for cold or warm conditions, the advanced material is designed to provide a cozy night's sleep, all year round. Available in Queen or King, and complete with one fitted sheet, one flat sheet, and two matching pillow cases. King size fits Cal King Beds. Machine washable. Machine wash in cold water with similar colors. Tumble dry on low heat. Do not bleach, dry clean or iron. Environmentally Friendly. Renewable at a rate that's faster than cotton and other materials, bamboo is also grown without pesticides or fertilizers by default. 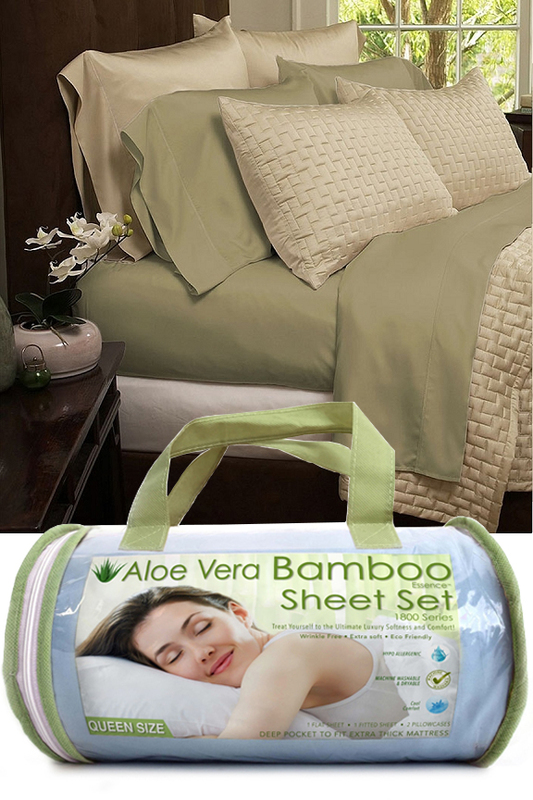 Choose this eco-friendly set to sleep comfortably and help mother nature. Incredible Comfort. Similar in feel to high thread count cotton sheets, the bamboo fiber gives these a natural feel that other microfiber sets can't match. High Quality. Better raw materials and superior construction provides a great looking set that will feel great and last for years. Deep Pockets. Thick mattresses or regular ones, it doesn't matter. The deep pockets on the fitted sheet will accommodate almost any style, up to 18". Wrinkle Free. Natural free of wrinkles, these come out of the dryer looking amazing, and without any need for an iron. Vibrant. Bold, modern colors ensure a good match to existing decor, and thanks to the top quality fabric, they will never fade over time, no matter how many times you wash them. Silky Soft. Similar to cashmere or silk, the material feels way more expensive than the price tag suggests. You'll be amazed at how nice they feel while sleeping. Breathable. The advanced blend will be comfortable in cold or hot weather, and ideal for year round use. Wicking. Known for it's absorption ability, the bamboo takes the breathable sheet one step further to help keep you dry as it prevents night sweats in the first place. Fresh. Unlike other natural fibers, bamboo does not allow for mildew and bacteria growth, and it is naturally hypoallergenic. Odors will not soak in, so these sheets will smell better, and extra durability allows you to wash them as frequently as you want. Extra Elastic. With stretchy stuff all the way around, you never have to worry about a good fit, or sheets that slip off while sleeping. Long Lasting. The dense and durable material will not wear out quickly, and the color will never fade. Wash them over and over again without damage or uncomfortable changes common with other options. 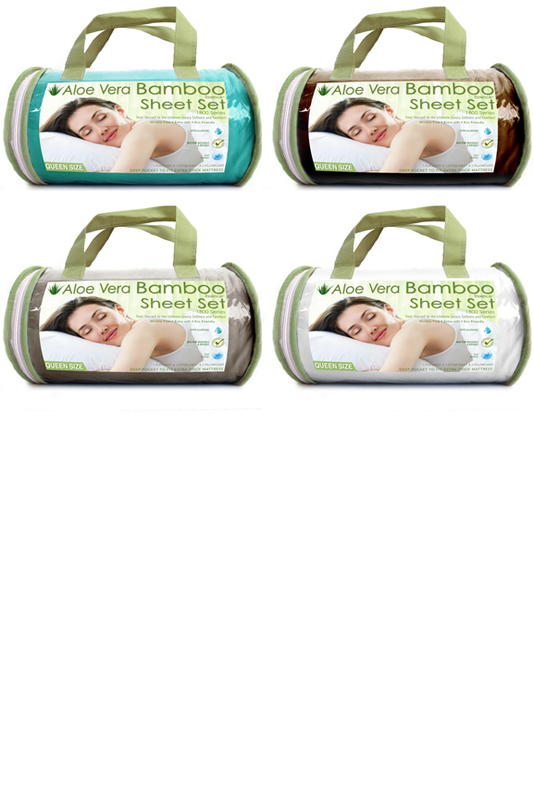 Bamboo sheets are much more comfortable than other options, but that's just the beginning. You also get a more durable and eco-friendly product when compared to cotton alternatives, and one that is super soft without paying for a higher thread count. Many people prefer bamboo to even Egyptian Cotton because it is so incredibly soft, but also longer lasting in comparison. It's also anti-microbial and hypoallergenic, so it's perfect for anyone that sweats at night, or is concerned about stinky sheets. Bamboo will not absorb your odors, no matter how much you perspire, and they can be washed repeatedly without worry of wear or damage. Because it is porous by nature, the natural material is also highly absorbent, and able to wick moisture away from your body. Add in breathe-ability that is unmatched, and you are in for incredible comfort every single night. Don't settle for scratchy, smelly, or wrinkly sheets on your bed. Get these instead to give your bedroom a makeover, and add the ultimate in softness and comfort at the same time. Queen Dimensions flat sheet - 88" x 99", fitted sheet - 60" x 80", pillow cases - 19.5" x 30"
King Dimensions flat sheet - 102" x 105", fitted sheet - 78" x 80", pillow cases - 20" x 40"
Washing Machine wash in cold water with similar colors. Tumble dry on low heat. Do not bleach, dry clean or iron. Eco-friendly bedding at an affordable price. 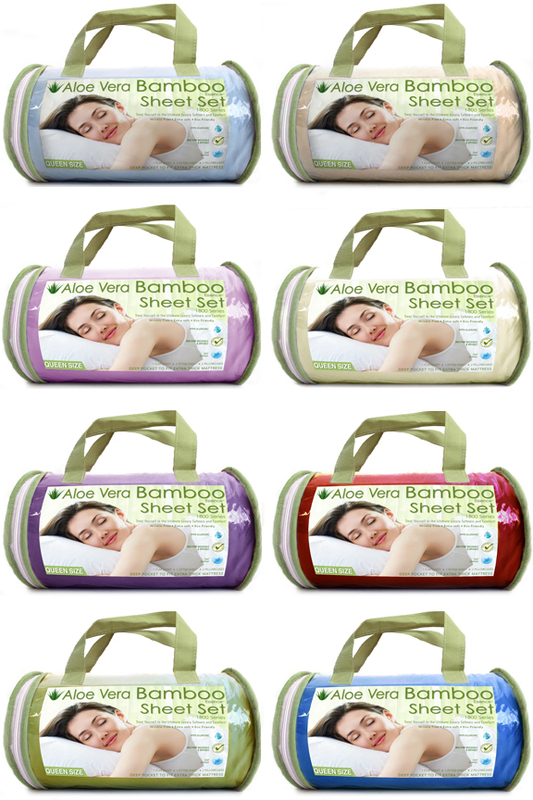 Bamboo creates a natural feeling sheet that's super soft, and amazingly durable. With a range of colors and sizes, these sets are perfect for anyone. Order Yours Today! They are soft, and I think that they're softer than most any sheets you could get at this price point. However, the type of softness is microfiber-ey soft, which' attracts lint like nothing else. Also, they're far warmer than I'd expected - I don't know how often we'll use them here in FL. Lastly, I found the 'cream' color to be pretty dark beige - if you're wanting something light, you may want to go with white. These bamboo sheets are amazing. I was a bit skeptical because of the low price but they are so soft, fit well with the deep pockets, corners do not rise up, and we just dream away. Wash and dry well, too. Very impressed with the quality for the price. These sheets are the preferred set at our house right now. They fit nice and tight and give a smooth and soft surface tio sleep on. The sheets are super, I even got a second set. I have told a lot of people about them. Love the sheets, light and of good quality. They feel great. I would order again. I was a little skepticle when I purchased these sheets; they were awesome! They were plenty deep enough for our bed mattress & the quilted pad we sleep on...were very silky to touch, and did not make we sweat like percale does. I will be buying a couple more sets, soon! Well, the sheets are mostly microfiber. Good quality microfiber at that. They are soft and light weight and comfortable to sleep on. I so far have not been able to determine where the bamboo fibers are incorporated into the cloth. That may be a good thing though. If they last and continue to be soft, I would buy again. They fit my Sleep Number bed! It's been hard to find affordable sheet with deep pockets. The stretchy elastic all around makes them fit perfectly. The only thing that would make it better is to be able to buy an additional pillowcase set separately. What thread count are these bamboo sheets? 10 of 11 Customer(s) found this Answer helpful. Will this fabric fuzz or pill with use? No it does not. They wear well, and last a long time. They fit comfortably on mattresses up to 18" thick. do you have bamboo sheets for full/double size bed? No. Not at this time. We only have Queen and King in this sheet type. 5 of 7 Customer(s) found this Answer helpful. I want to see a large view of the sheet colors. I can't a way on your website to enlarge the view. Can you help me? If you hover over the product image, it should zoom to make the color swatches larger. Please give us a call if you need help making a choice. The pockets are sewn to 16" to allow for a good fit on beds up to 18" high. Are they REALLY wrinkle free? Will they stay on an adjustable mattress? Yes. They have elastic all the way around, so they should stay just fine on your adjustable mattress. What percent is the bamboo content to polyester? The bamboo content is 40%. are these sheets made in the US? 1 of 4 Customer(s) found this Answer helpful.